(Photo: © Peter Kenny / Ecumenical News)A woman prays in Church of the Holy Sepulcher where Orthodox Christians celebrated Easter on May 1, 2016. Photo taken on Feb. 10, 2016. Orthodox Christians across the world have celebrated Easter, their most important religious holiday that celebrates the resurrection of Jesus after his crucifixion, with celebrations in cities such as Athens, Damascus, Jerusalem, Kiev and Moscow. In Jerusalem mass was held inside the Church of the Holy Sepulcher, the site where Christians believe Jesus was crucified, buried and resurrected. Followers took part in the reception of the Holy Fire, represented by lighting people's candles before parading around the inner temple and chanting, euronews.com reported. 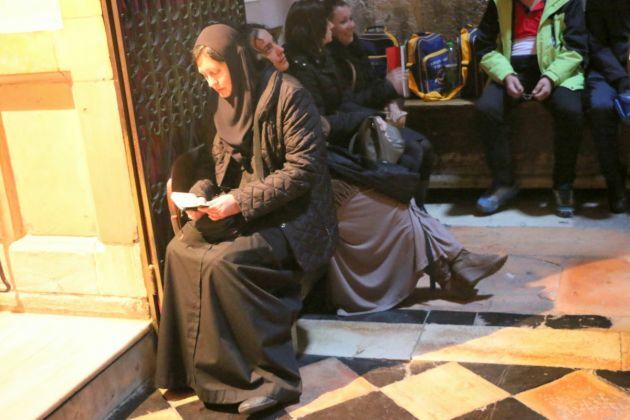 In the Syrian capital Damascus, hundreds of worshippers attended mass at the Holy Cross Church. While the Syrian war has badly hit everyone regardless of religion in the country as a minority in the country Christians have faced mounting persecution. In Moscow, thousands of people lined up outside Christ the Savior Cathedral on May 1 to attend the Easter service with Russian President Vladimir Putin and Prime Minister Dmitry Medvedev among those visiting the church, Russia Today reports. Roman Catholics and Protestants celebrated Easter in March, in accordance with the Gregorian calendar while Eastern Orthodox churches marked Easter this week, basing their date on the older Julian calendar. The service was led by Patriarch Kirill of Moscow and All Russia, the head of the Russian Orthodox Church. Easter celebrations for Russian soldiers in Syria were held in a makeshift church on an unnamed airbase with RT saying it was the first time that a Russian Orthodox Church bell chimed on Syrian soil to celebrate Christ's resurrection. In Kiev, Ukrainian President Petro Poroshenko along with his wife Maryna visited several Easter services churches to wish the parishioners Happy Easter. The presidential couple attended a sacred procession at St. Volodymyr Cathedral together with Patriarch Filaret, Head of the Ukrainian Orthodox Church of the Kyivan Patriarchate. The Poroshenkos also visited the Greek-Catholic Church of St. Nicholas (Mykolai), and a church in Kiev Pechersk Lavra belonging to the Ukrainian Orthodox Church of the Moscow Patriarchate, Ukraine Today reported. The Kyivan Moscow Patriarchates are estranged from one another and Ukrainian church not part of the Orthodox churches official grouping. Ukraine's government had agreed a new truce with pro-Russian insurgents, which took effect on Orthodox Easter weekend with the cessation of hostilities coming at a time of reports that fighting has reached levels not seen for months. The agreement was reached to halt violence in eastern Ukraine - at least until May 9, the Organization for Security and Cooperation in Europe (OSCE) had announced on April 29 dw.com reported.